an effective, alternative avenue for fostering class dis-cussion. classroom management, course-related, and controversial is-sues. Dutt-Doner, K.M. & Powers, S.M. (2000). The Use of Electronic Communication to Develop Alternative Avenues for Classroom Discussion. 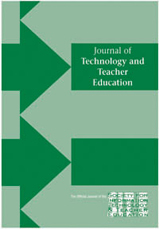 Journal of Technology and Teacher Education, 8 (2), 153-172. Charlottesville, VA: Society for Information Technology & Teacher Education. Retrieved April 25, 2019 from https://www.learntechlib.org/primary/p/8033/.